"As Jesus was walking beside the Sea of Galilee, he saw two brothers, Simon called Peter and his brother Andrew. They were casting a net into the lake, for they were fishermen. 'Come, follow me,' Jesus said, 'and I will make you fishers of men.' At once they left their nets and followed him." "When [John the Baptist] saw Jesus passing by, he said, 'Look, the Lamb of God!' When the two disciples heard him say this, they followed Jesus. . . . Andrew, Simon Peter's brother, was one of the two who heard what John had said and who had followed Jesus. The first thing Andrew did was to find his brother Simon and tell him, 'We have found the Messiah' (that is, the Christ). And he brought him to Jesus." Considering himself unworthy to die the same type of death that Christ had died, the patron saint of Scotland requested that his executioners bind him to an X-shaped cross, when they crucified him in Patras, Greece. 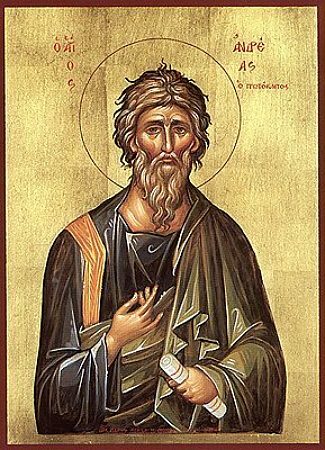 A fisherman from Galilee, Andrew was one of the original Twelve Apostles, a follower of John the Baptist before becoming a disciple of Christ. Following Pentecost, Andrew left the Holy Land to preach the Gospel throughout Greece and Asia Minor. During the reign of Emperor Nero, Andrew was working in Patras, where he baptized the wife and brother of the governor, Aegeus. The governor was so incensed that he sentenced the apostle to death by crucifixion. 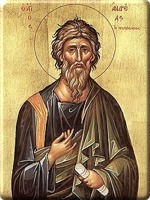 Andrew was martyred on 30 November in the year 60 A.D.
His remains were buried in Patras until Emperor Constantine ordered them removed to Constantinople in 357 A.D. Legend has it that before this could take place, Saint Rule had a vision in which an angel told him to take whatever relics he could "to the ends of the earth" for safe keeping. St. Rule sailed beyond the reaches of the Mediterranean before being ship-wrecked on the eastern coast of Scotland at Kilrymont in Fife. 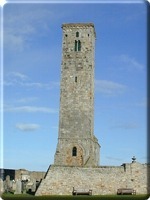 He founded a church at that site, which became present-day St. Andrews. The relics are said to include three fingers from the saint's right hand, part of an arm, one kneecap, and one tooth. More likely, however, is that the relics were brought from Hexham to Kilrymont in 732 by the bishop Acca, who was seeking asylum with the Pictish King Angus Mac Fergus. Soon afterwards, the king's nation was attacked by Anglo-Saxons. The night before the battle, the Christian king prayed for deliverance. 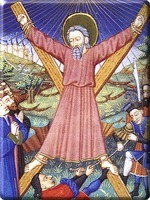 According to tradition, Saint Andrew appeared to King Angus and promised that he would lead his armies to victory under the sign of the cross. Afterwards, St. Rules Church in Kilrymont became a major destination for pilgrims who wanted to venerate the relics of the first-called apostle. 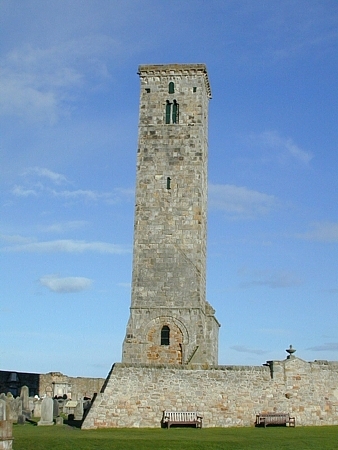 In 1158, construction began on the grand St. Andrews Cathedral, built to replace St. Rules and to serve as the seat of the Diocese (and later Archdiocese) of St. Andrews, the centre of Roman Catholicism in Scotland. 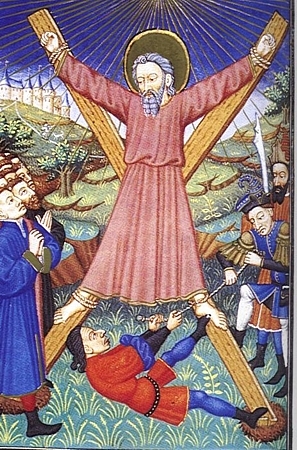 Believing that the apostle had chosen them to protect his relics, the Scottish people of the middle ages looked to Saint Andrew for a symbol of national identity. He became Scotland's official patron saint in 1320, named as such in the Declaration of Arbroath. The relics, however, were destroyed on 14th June 1559 along with the interior of St. Andrews Cathedral by a mob stirred to violence by one of John Knox's impassioned sermons. Three centuries later, the Archbishop of Amalfi gave the Archbishop of St. Andrews and Edinburgh a large portion of the saint's shoulder so that Scotland could again house relics of its patron saint. In 1969, Pope Paul VI presented additional relics to Archbishop of St. Andrews, Gordon Joseph Gray, upon his promotion to cardinal in 1969 with the message, "Saint Peter greets his brother Andrew." These relics are enshrined in the Cathedral Church of Saint Mary in Edinburgh, seat of the archdiocese.